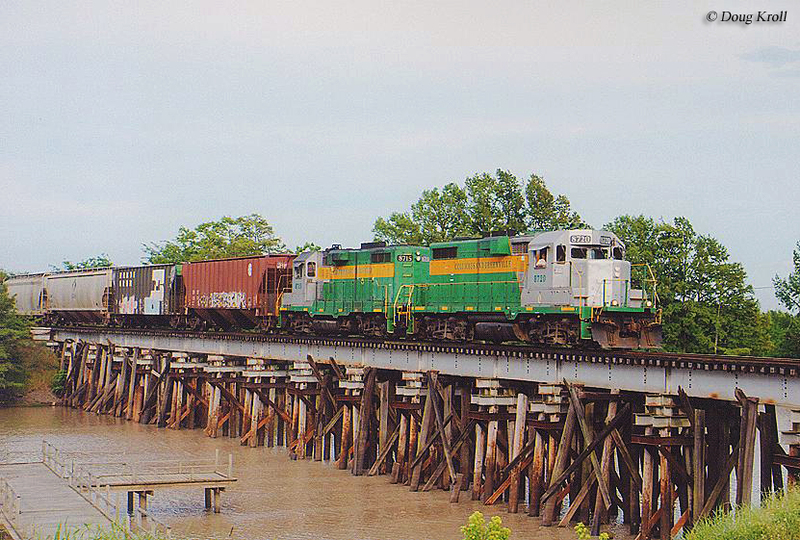 Mississippi Railroads And Railfanning In "The Magnolia State"
Mississippi defines Southern rail operations at their finest; flat and swampy terrain mixed in with lots of water, coastal operations and port services. Perhaps no other railroad showcased the Magnolia State like the Illinois Central and Gulf, Mobile & Ohio railroads, both of which had a significant presence in the state. 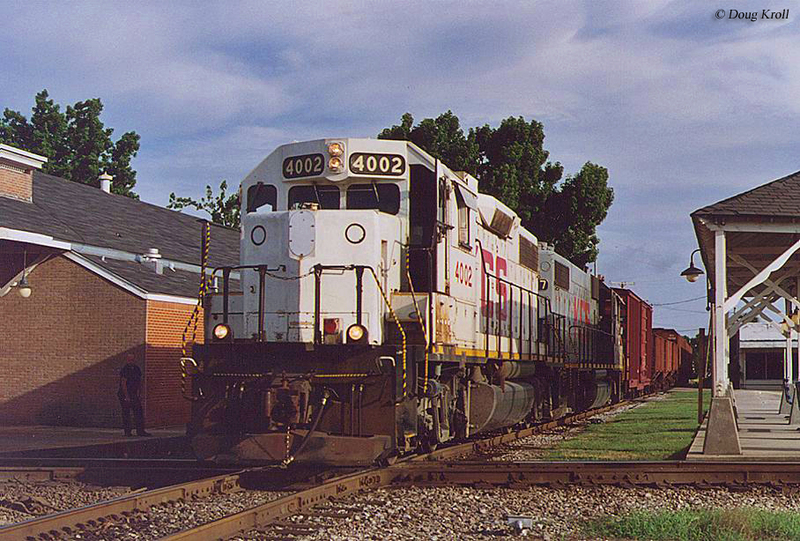 However, there were also a number of other classic, "fallen flag" lines that operated in Mississippi and what made the state rather unique is that it featured main lines operated north-south as well as east-west. Today the state is still an important originator of traffic (particularly with chemicals and petroleum given its location along the Gulf Coast) with most movements handled by five of North America's seven Class I railroads, along with one Class II regional, and a multitude of smaller short lines. Finally, please note that for your interest throughout the article here there will be links to other pages here at the site which are related to Mississippi railroads. 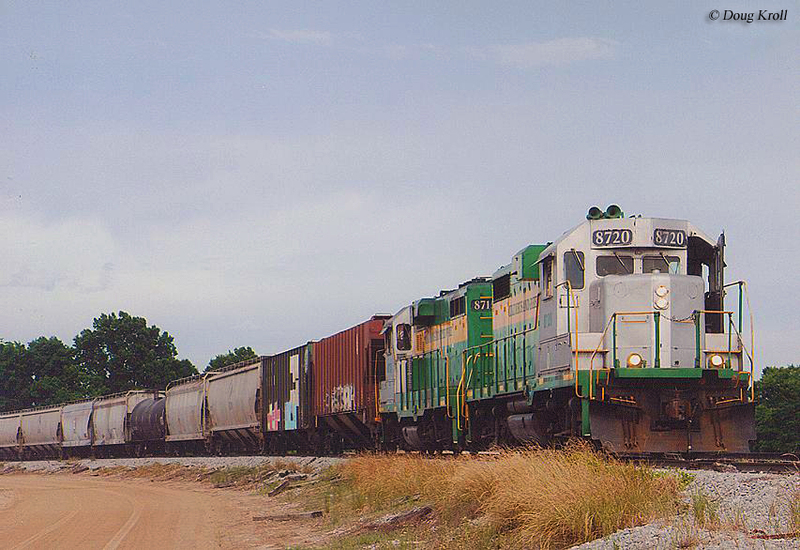 Mississippi's rail history date back to 1835 when the West Feliciana Railroad began operations hauling the southern staple product of cotton. By 1842 the railroad had completed its main line between between Bayou Sara, Louisiana and Woodville, Mississippi a distance of 25 miles. The idea for the West Feliciana, however, dated as far back as 1828 with the railroad being officially chartered in 1831. The line operated independently until it became part of the Yazoo & Mississippi Valley Railroad, which was later controlled by the Illinois Central. Interestingly the little railroad lasted 136 years until being mostly abandoned IC in 1978. In terms of where the West Feliciana lay in the IC's system it was located right along the Louisiana/Mississippi border on the southwestern edge of the railroad. 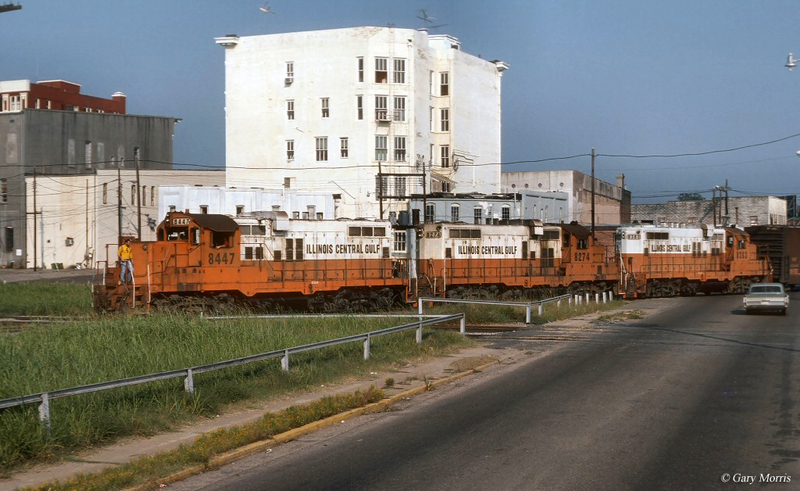 Following the opening of the West Feliciana Railroad, the Magnolia State would find itself home to not only the Illinois Central and Gulf, Mobile & Ohio but also several other now-classic railroads. Interestingly, today Mississippi is home to nearly as many Class I railroads as during any time in the state's history which include CSX, Norfolk Southern, Canadian National, BNSF Railway and Kansas City Southern Railway. While these Class I railroads constitute much of the trackage operated in Mississippi the state is also home to Class II, regional Alabama & Gulf Coast Railway as well as several shortlines. These railroads, which have at least a minor presence in the state include the Alabama Southern Railroad, Gloster Southern Railroad, Columbus & Greenville Railway, Golden Triangle Railroad, Great River Railroad, Kosciusko & Southwestern Railway, Luxapalila Valley Railroad, Meridian & Bigbee, Meridian Southern Railway, Mississippi Central, Mississippi Delta, Mississippi Export Railroad, Mississippi & Skuna Valley Railroad, Mississippi Southern, Mississippi Tennessee Railroad, Mississippian Railway Cooperative, Old Augusta Railroad, Port Bienville Railroad, Redmont Railway, RJ Corman's Tennessee Terminal, Tishomingo Railroad, Vicksburg Southern, and the West Tennessee Railroad. Altogether, these railroads operate roughly 2,500 miles of track in Mississippi although at one time the state was home to nearly 4,400 miles. With a loss of about 46% of its rail infrastructure since the "Golden Years" of the 1920s this loss is about average in comparison to the declines other states have witnessed. 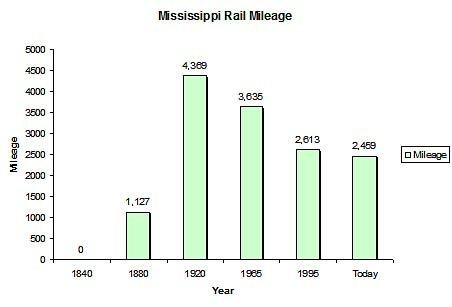 For information about Mississippi railroads in terms of route mileage over the decades please have a look at the chart above. While Mississippi no longer features celebrated passenger trains of the South like the Abraham Lincoln, Crescent, City of New Orleans and Pan American Amtrak continues to operate the Crescent and City of New Orleans over Norfolk Southern and Canadian National trackage in the Magnolia State (the Sunset Limited used to stretch as far as western Florida and included four stops in Mississippi but has yet to resume service that far east since the Hurricane Katrina catastrophe). In any event, if you tire of live freight trains or just aren't interested in that sort of thing Mississippi also includes several railroad museums. 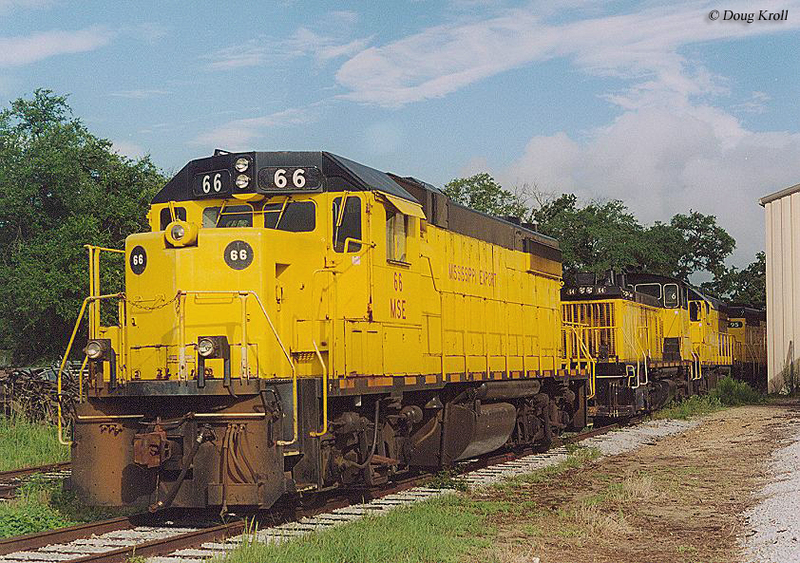 These include the Booneville Rails & Trails Museum, Gulfport Union Depot, Canton Train Museum, Crossroads Museum, Sam Wilhite Transportation Museum, McComb Depot, the Walter Valley Casey Jones Railroad Museum, Corinth Union Station, Meridian Freight House, and West Point Transportation Museum. Unfortunately, at the current time there are no excursion trains or tourist railroads currently operating in Mississippi. While Mississippi may not offer the excitement of challenging mountainous grades they do feature a colorful mix of most of North America's Class I systems, Amtrak operations and local shortline service which should make for an enjoyable trip to the Magnolia State.